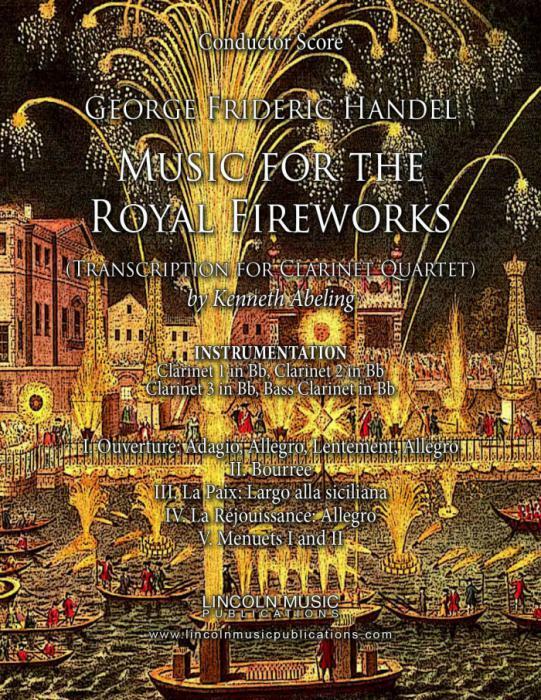 This is “Music for the Royal Fireworks” or Royal Fireworks Music by George Frideric Handel transcribed here for Clarinet Quartet. This is an easier advanced transcription of one Handel’s most popular works and may be performed in its entirety or as separate movements. It is quite appropriate for use during segments of religious services. The five movements are: I. Ouverture: Adagio, Allegro, Lentement, Allegro - II. Bourrée – III. La Paix: Largo alla siciliana – IV. La Réjouissance: Allegro – V. Menuets I and II.